Basil cultivation is age old but at present basil is enjoying more popularity all over the world than ever before; not only for its delicious aroma, which enriches any cuisine, but also because it represents the quality, simplicity and uniqueness of the Ligurian territory. Basil, the principle ingredient of the delicious pasta dish "Pesto alla Genovese", is surely one of the most typical and representative cultivation of all Ligurian agriculture, and is unquestionably the symbol of mediterranean tastes and cuisine and also of the agriculture of Liguria, which is "hangs" in more ways than one, on the sea. Beginning from the farm-lands surrounding the city of Genoa, from which the famous dish "pasta alla Genovese" takes its name, basil cultivation spreads the entire region. 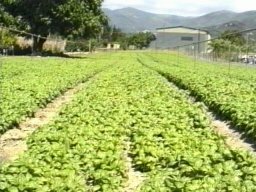 The Quality of basil strongly depends on the environment in which it is grown. Thanks to its particular mild climate, abundant sunshine and the sea breeze which plays such an important role, the entire region of Liguria proves to be ideal for basil farming. Such favourable land and conditions have lead to the development of specific techniques, which unite tradition and innovation. The application, for example, of biological systems, to exalt natural properties of our products.